Which kind of smartphones do you like best? Perhaps most people would have a preference for iPhone or Sumsung. But as far as I'm concerned, I like to access Huawei phone not only for its unique appearance but for its reasonable price. What's more, all sorts of function is also very good and easy for me to use. However, one day, I deleted the photos, videos and whatsapp data on my Huawei phone by accident. I thought I had just done the stupid thing which upset me a lot. 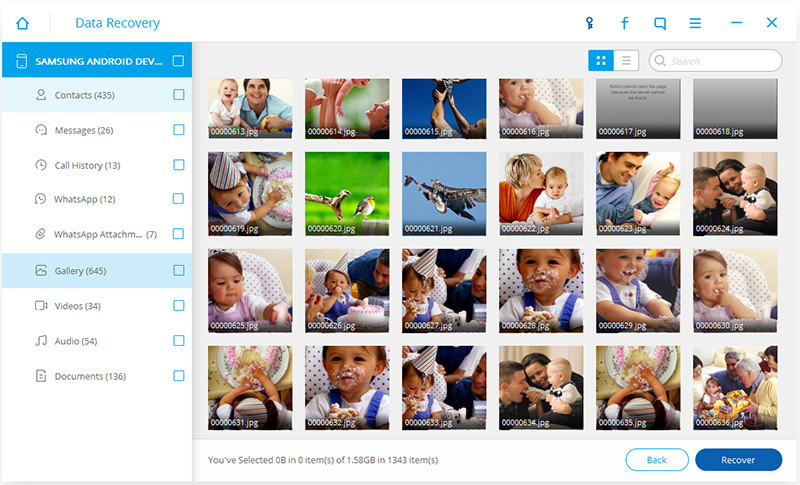 For me, it was easy for me to recover the deleted photos and videos, but I had no idea to get back the whatspp data. When it comes to whatsapp, it is an application for communication between smartphones, currently available for the iPhone, Android phones, Windows phones. For the reason that there are many important information including WhatsApp Chats history, Photos and Videos on it, I have to find a solution to my problem. To my delight, my sister introduced me a kind of useful software, Huawei Data Recovery to help me solve this problem. What is it? Huawei Data Recovery is a powerful toolkit for Huawei as well as Android users to recover deleted data including text messages, photos, contacts, call history, videos, WhatsApp messages, audio files, and more from Huawei (Android) phones and tablets. I think with the help of Huawei Data Recovery, recovering the deleted and lost data on your Huawei phone is just an easy job. So how to use it? Now I will share the steps with you, just take the Huawei P9 phone as an example, which will be shown in the following steps. 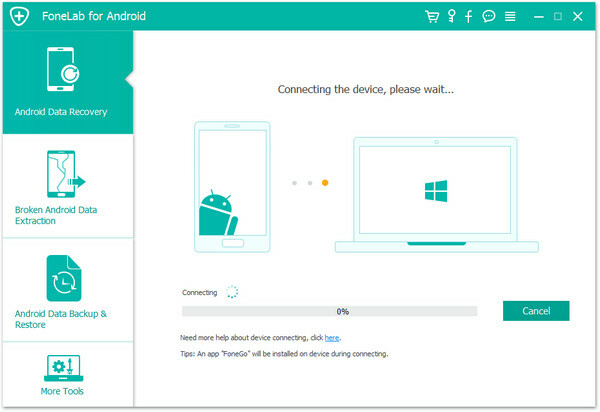 Download, install and launch Huawei Data Recovery on your computer, when you can see the primary window, you are allowed to connect your Huawei P9 with your computer via a USB cable. 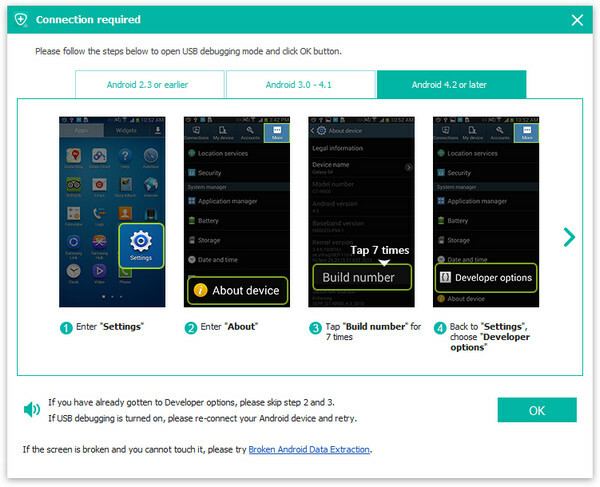 Note: For different OS of your Huawei phone, you need to enable USB debugging by following the below window. Once the program detects your Huawei P9, you can check the type of data that you’d like to recover. And then click “Next” to continue the data recovery process. To begin analyzing and scanning your Huawei Phone by choosing a scanning mode, there are“Standard Mode” or the “Advanced Mode” here for you to choose to continue according to your need. We recommend you to try the “Standard Mode” first, which works faster. If it doesn’t work, you can try the “Advanced Mode” later. After that, click on "Start" to go on. Be careful. 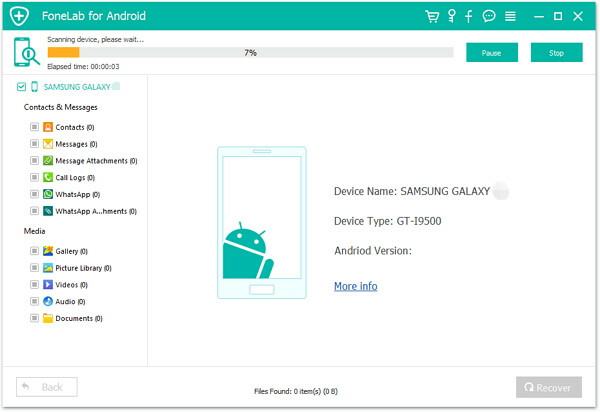 There might be a Superuser authorization appearing on your device during the scan. If you get it, click “Allow” to confirm it. If not, just forget it. 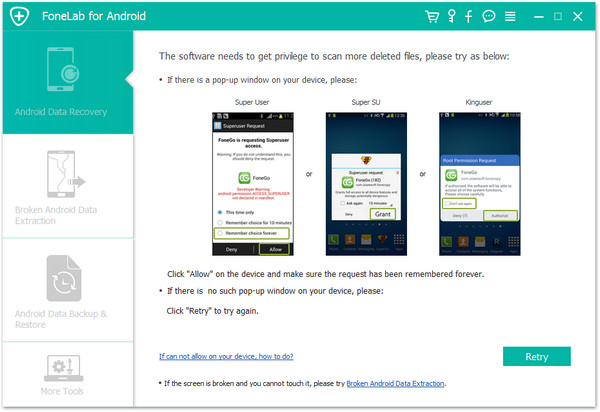 This Huawei data recovery software scans both deleted and existing data on your Huawei and Android Phone. You can turn on the button of “Display deleted files only” to separate them if you have a need. Also, you can use the search function on the top right to search what you need in the scan result. 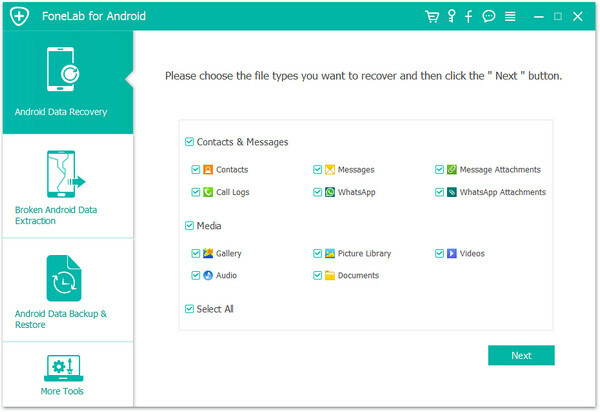 Huawei Files Recovery shows the best solution for Huawei users to retrieve lost and deleted data including contacts, text messages and more from any Huawei phone and tablet, including Huawei P8/P9, Huawei Mate 7/Mate 8, etc.